The Crazy Bookworm: Hungry for The Hungry Games? Are you hungry for The Hunger Games? 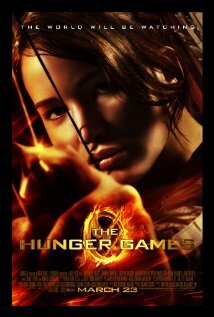 The Hunger Games is hitting theatres March 23rd, and I know many of us are eargerly awaiting it's arrival! Let's celebrate it's release with a giveaway...or two...or three! That's right, The Crazy Bookworm is hosting a 3 prize pack givaway. It will go over 3 weeks. Week #1 will be a giveaway. Week #2 you can enter for another giveaway and then Week #3 you can enter for the grand prize! 3 different giveaways, 3 chances to win! All 3 giveaways will run until the end of the month, so you will have more than enough time to enter each one. Isn't that fun? I know, I know. Your wondering what the giveaways will consits of...well you will have to wait and see! What I can tell you is that everything will consist of Hunger Games awesomeness! Week #1 will kick off Wednesday, March 7th! Exciting news! I look forward to more details of this contest.